We bet you are curious about these things called “Colabs”. We have prepared this summary to provide you with some background information on the expectations, the process, and the experience. If you are able to participate, you will be guided through the process, so don’t feel as if you first need to deeply understand each element of one; most people learn about them by participating. A Colab is a unique and powerful type of facilitated meeting that is ultimately unlike anything you have experienced. 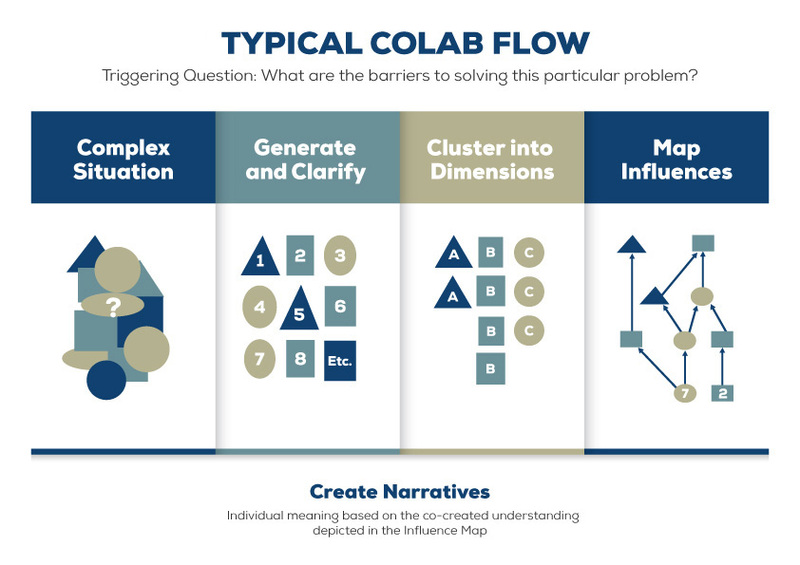 “Colab” is the name of the gathering of stakeholders who together share, learn, and create a deep understanding of a complex problem using the Structured Democratic Dialogue (SDD) process. There may be some elements of a Colab using SDD that seem familiar on the surface. When finished however, you will find the experience truly remarkable and well worth the personal investment. Why conduct a Colab with SDD? There are problems in the world that can’t be completely solved. They are too complex and strongly resist change. They actually don’t have an ultimate solution. For example, consider trying to prevent every student from dropping out of high school. The academic literature calls this type of problem “Wicked.” Colabs are specifically designed to address wicked problems by efficiently tapping into the collective wisdom of a wide variety of stakeholders. What is the basis for SDD? Dialogue must be structured so that participants can think clearly by ensuring they are not overloaded with too much information. Each idea must be protected so that its independence and genuineness remain. The whole group learns and evolves as each participant sees how their ideas influence those of others. A diversity of viewpoints is essential when engaging stakeholders in a dialogue for defining and resolving a complex issue. Participants will understand the relative importance of their ideas only when their ideas are compared with others. Through understanding how different people’s ideas relate, participants become wiser about the meaning of their own ideas. Supports revisions at any phase of the dialogue. The first step in the process is a rigorous Discovery phase led by a core planning team (i.e., a small group of people knowledgeable about the problem and about the environment in which the problem exists). During the Discovery phase the vital stakeholder groups are identified. Each group must be represented in the Colabs to form a complete picture of the problem. Some preliminary work is done to understand the variety in these perspectives and is presented in a report sent in advance to Colab participants. The report helps prepare Colab participants to hear a variety of perspectives beyond those they have considered. The final product is the Triggering Question. It’s the question around which the entire Colab is focused. What happens in a Colab? When you walk into the room, you will see tables formed into a U-shape with a specific seat assigned to you. Food is provided as well as comfortable chairs and reasonable breaks so that you can be fully engaged whenever the dialogue is underway. The Sponsor is the person who convened the Colab, and has overall responsibility for using the output from the Colab to address the wicked problem. The Sponsor launches the Colab by making a statement that reminds all participants of the importance of the work that they will do. This statement is followed by a second statement that puts a specific charge to the group. This charge is presented as a “Triggering Question” (TQ) that will continuously guide the dialogue and deliberations of the group. This TQ is fully clarified with the group at the beginning of the Colab. If the group has concerns about the TQ, the sponsor can agree to change its wording. Dialogue Manager who controls the SDD process and directs the activities of the DMT. The Dialogue Manager ensures the six SDD principles are followed during the Colab. Supporting the Dialogue Manager are typically a Production Manager, an Assistant Production Manager, and a Professional Recorder. The Production Manager and Assistant Production Manager ensure all the technology operates effectively and captures the content that is generated by the participants. Since this is often more than a one person job, there is typically an assistant as well. The Professional Recorder electronically captures, in real time, exactly what each participant says at specific points in the SDD process. Often this role is performed remotely. SDD follows a process that is pictorially represented below. The process starts with a complex situation. Responding to the triggering question, first silently, then shared out loud when asked, Colab participants generate ideas. Each participant gives their idea a brief headline and explains and clarifies their idea based on questions from other participants. After there are no more new ideas, participants explore similarities among the ideas. If ideas are similar, they are clustered together; if not, a new cluster is formed. After all the clusters are created, they are named to represent the various dimensions of the problem. Each participant then votes for their five most important ideas. The group’s results provide the basis for selecting an initial set of important ideas that are used as the group determines how the ideas significantly influence one another. The influence is found by having the computer select and present two ideas for the entire group to review, and then the group determines if one significantly influences the other. If a super majority of the group (more than 75%) determines there is a significant influence, then one is recorded. If not, that is recorded as well and the computer picks two more until the group has completed all their necessary discussions and decisions. When all the necessary pairs are reviewed, the SDD software displays an influence map showing the group’s collective decisions. The most influential ideas are shown at the bottom of the map with arrows showing what they influence and how this influence spreads through the system. The participants then create individual stories that explain what the map means to them. Using these narratives, each person can communicate this new understanding to others. What can you expect from a Colab? Because of SDD, the participants generate a deeper understanding and better designs for improvement than they can in any other way. What are the expectations of Colab participants? These expectations are serious. If you commit to participate, you commit to upholding these. Hopefully, you now understand a bit more about what you can expect from a Colab. With this deeper understanding, we hope you want to become a Colab participant. We know this will be a unique and powerful experience for you. We are looking forward to hearing your wisdom!